Arena Pantanal hosted it’s first official match on Wednesday 2nd April, between Mixto (MT) and Santos F.C., for the Brasil Cup first round. 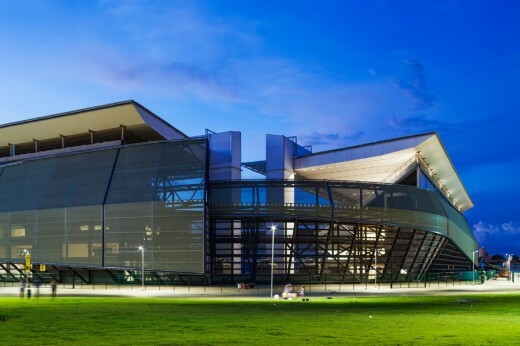 With design by GCP Architects, the new arena is gaining national and international prestige due to the concern over the legacy and the various eco-efficient solutions employed. 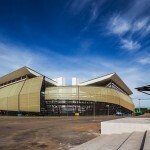 The Arena Pantanal project represents precisely our line of work, always supported by a quality design and high standard requirements of urban, social and environmental responsibility,” says Archit. Sergio Coelho, principal at GCP Architects and responsible for the project. 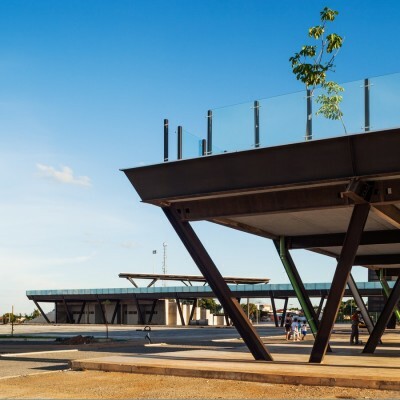 Around the stadium, an area with more than 300,000sqm, the local community have access to a park with play area, walking track, snack bars, museum and restaurant as well as a rich landscaping project with lots of greenery and a pound. The concern with legacy can be exemplified by the design flexibility. During the World Cup, the stadium will seat 42,968 spectators, given the minimum established by FIFA – arenas where there is a 40 000 fans. 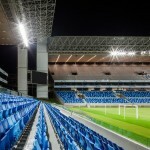 However, as the structure is made of modular steel and precast concrete parts in the upper grandstands at the Northern and Southern sectors, the government of Mato Grosso State can evaluate the post-tournament demand and eventually, reducing the capacity for up to 27,000 spectators, consequently, reducing maintenance costs and also spreading the legacy of the World Cup throughout the State, since up to two smaller stadiums could receive the grandstand modules, increasing its spectators capacity. 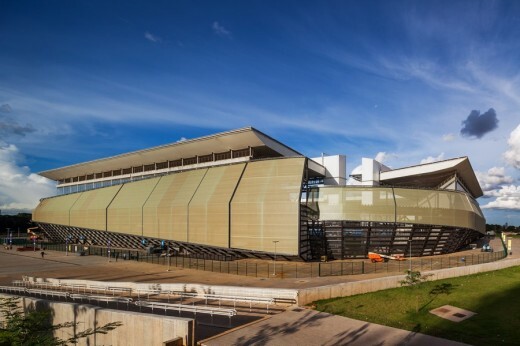 With covered seats, Arena Pantanal, as a multi-purpose venue, would be also able to receive besides football, diverse events, such as concerts, exhibitions and fairs and others sports. 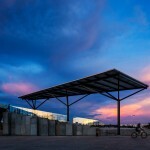 Regarding sustainability solutions, the list is extensive, and includes since the reuse of water, natural ventilation and the use of solar power by the use of building materials and systems that enabled the LEED (Leadership in Energy and Environmental Design), a international system designed to verify and certify the environmental quality of a development. 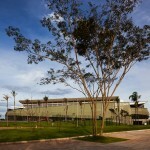 The Arena Pantanal project exceeds the FIFA program and deliver to the city a leisure area with superb landscaping. All species are local, belonging to the Cerrado, the Atlantic Forest and Amazon Rainforest ecosystems, representing the three biomes present in the State of Mato Grosso. In addition to the areas of landscaping the park received an area for environmental restoration, with more than 2,000 trees, creating a micro-climate that will benefit the local thermal comfort. 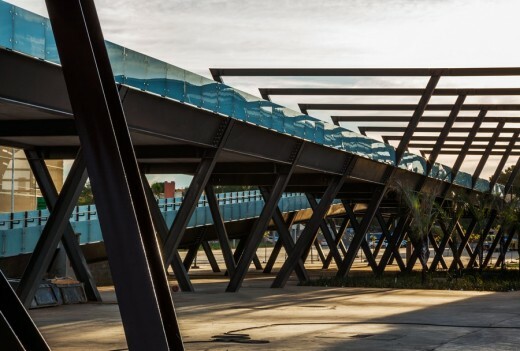 Waste and Construction debris undergo a process of recycling and reuse, resulting 24 000 m³ of concrete and masonry from the demolished “Verdão” stadium, reused in the construction and access roads paving. All wood used in the building is certified, and any other materials and services considered more environmentally friendly or environmental certifications. 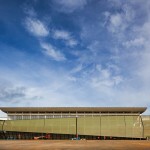 The design aimed the best use of natural lighting and cross ventilation, helping energy efficiency. 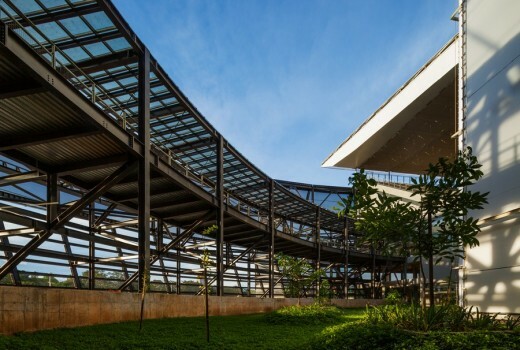 The more permeable and airy architectural form, creating microclimates with vegetation, the use of water ponds and also the location of the building and of the football pitch, protected from strong sunlight due to an envelope made of metal louvers associated with a membrane of cast-glazed PVC providing significant reduction in energy use. The cooling system includes equipment such as pumps, cooling towers, chillers and air conditioners. With the cooling water that will circulate throughout the Arena, the system will allow power savings of 15% per year, compared to usual residential systems. Hydraulic systems will save approximately 40% of the consumption of a similar building, mainly due to the use of sanitary wear and faucets with water flow controlled and reduced. 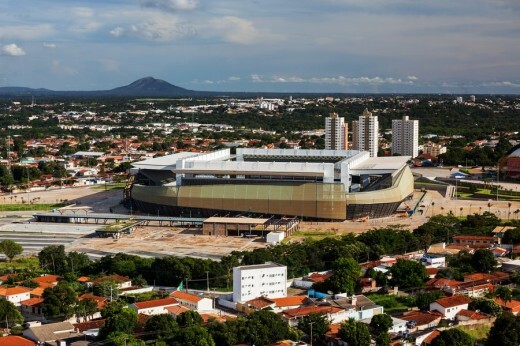 To achieve the reduction rate of water consumption, cited above, Arena Pantanal will reuse part of their effluent in order to integrate all its systems. 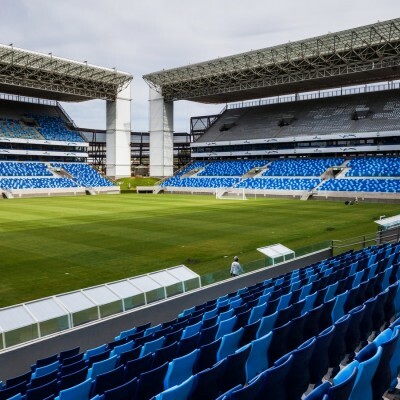 There will be reusing rainwater captured in the stadium roof and in the pitch to be used in cooling equipment, floors washing and in the toilet flushes. Approximately 1,500 trees and 300 shrubs were planted, a number that can reach 2,500 trees in the legacy mode. The large arboreal presence provides a pleasant micro climate in terms of temperature and humidity, as well as allowing better return of the stormwater to the ground, because the trees through their root systems also act as water reservoirs and natural drainage channels. The effectiveness of landscaping is extensive, but was certainly considered also the scenic beauty of the trees and their blossoms.